A number of strategic investments have been completed and new investment projects have been initiated since MOL joined INA. Continued development of activities in upstream, midstream and downstream in Croatia has been executed, with Initial Business Plan investment levels (set during the privatization process) overachieved in all segments. The yearly average value of INA’s investments increased more than 2.5 times – from an average value of around HRK 1 billion (EUR 135 million) to HRK 2.7 billion (EUR 365 million) – compared with the decade prior to INA’s privatization. During the strategic partnership between MOL and Croatia, INA has invested almost HRK 18 billion (EUR 2.25 billion) in its upstream segment. This is several times the amount invested in the decade preceding MOL’s presence in the company. When MOL took over the management of INA, practically no new upstream projects were prepared for launch. The new management intensively looked for project ideas, and also revised old project proposals that for various reasons were not carried out. One example is INA’s EOR project, a major upstream investment project to improve hydrocarbon recovery from existing fields, which currently is in the implementation phase. Several key projects were also realized in this period: more than 90% of the strategically important investments into the Northern Adriatic and the Syrian assets have been realized since 2003, totalling at about HRK 10 billion; important cross-border exploration (in Zalata-Dravica and Novi Gradac-Potony) activities were carried out. It was also on MOL’s initiative that the re-evaluation of Croatian onshore prospects was carried out in 2009-2010 even though the Initial Business plan (an annex to the 2003 Shareholders Agreement that the Croatian government approved), redirected focus from onshore exploration activities in Croatia. The strategically important seismic scanning of the Southern Adriatic region was also carried out in these years. MOL continues to firmly believe that Upstream is the real growth engine of INA, and is committed to further develop this segment. INA’s major modernization effort started in 2005, a few years after many refineries across Europe completed similar modernization initiatives. The main incentive was Croatia’s impending EU accession which required the company to produce fuels in line with EURO V specifications. The first phase of the modernization plan was finished in both refineries in 2011. Between 2003 and 2013, more than HRK 8 billion (EUR 1.1 billion) was invested in Croatia’s refinery system by INA. However, much of this investment was delayed due to slow permitting procedures, such as the delayed coker for Rijeka that would have brought a further EUR 300-350 million of investment. The EURO V specifications require different motor fuels attributes such as different levels of sulphur. INA was not able to reach the required 10 PPM (parts-per-million) level of sulphur in its fuels based on the refinery setup in place before the modernization – meaning that a considerable amount of desulphurization capacity had to be added to refineries with sizeable investments to be competitive in the European market. By the end of 2005, INA’s management decided to start the first phase of the modernization. For example, the contract for the Sulphur Recovery Unit in Sisak was concluded. This unit allows the refinery to significantly lower the sulphur dioxide and benzene emissions, and reduce the refinery’s flaring, a source of significant CO2 emissions. It also improves the profitability of the refinery by turning a waste material, the sulphur removed from fuel, into a product that can be sold to chemical firms. In 2006, the construction of the Sisak Sulphur Recovery unit was well under way while investments in the Rijeka refinery included tank farm reconstruction, sewage system revamps and installation of gas emission measurement equipments. 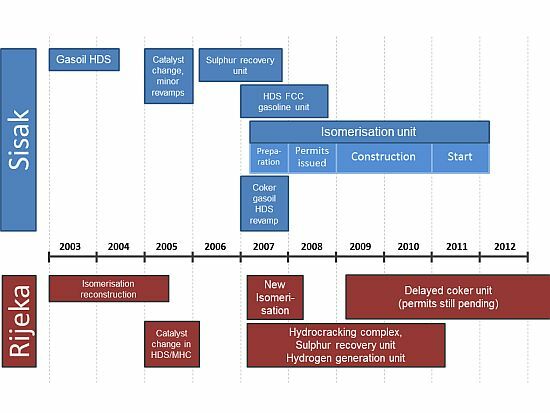 The Sulphur Recovery Unit came online in the Sisak refinery in 2007, while in parallel, the contracting of the large Isomerization Unit was initiated. In Rijeka, contracts were signed on the major Hydrocracking Complex, the Sulphur Recovery Unit and the Hydrogen Generation unit. In 2008, works on the combined Hydrodesulphurization & Fluid Catalytic Cracker (FCC) were finished in Sisak, allowing the refinery to finally produce lower sulphur content gasoline. The permits for the Isomerization unit were also issued. In Rijeka, the construction of the Hydrocracking Complex, the Sulphur Recovery Unit and the Hydrogen Generating Unit (HGU) were started. In 2009, two years after the initial preparations, the construction of the Isomerization Unit in Sisak and three Rijeka units started. At this point, INA had already spent HRK 2.7 billion (EUR 350 million) on the modernization program, with investments peaking in 2008. This amount grew to almost HRK 4 billion (EUR 520 million) by the end of 2010, with the investments in both refineries becoming operational that same year. In early 2009, the plans for the Rijeka refinery’s major new unit, the DCU (Delayed Coker Unit), were also approved and the application for environmental permits submitted. This unit could vastly improve the configuration of the refinery. However, the environmental impact study, the first phase of the permitting process, was not approved until December 2013. The three units in the Rijeka refinery (Hydrocracking Complex, Sulphur Recovery unit, and Hydrogen generation unit) were all in operation in February 2011; the Isomerization Unit in Sisak was finally online in January 2012, marking the completion of the first phase of the planned modernization in both refineries. When MOL took over management control of INA in 2009, the company had not seen significant investments in its retail business in the preceding period. Today INA has the biggest modern retail network in Croatia due to a comprehensive investment program started in 2010 (named Blue Concept) that was initiated and championed by MOL. 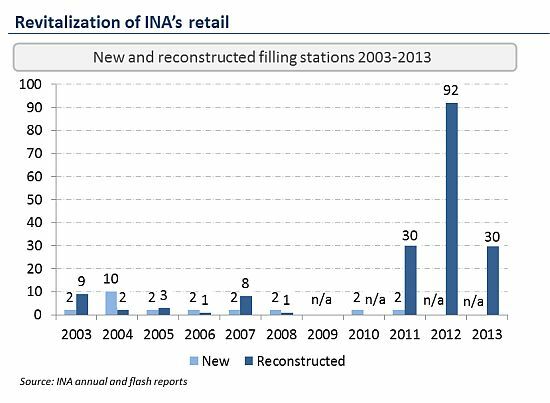 Before 2009, only minor upgrades across INA’s retail network had been made, and the network risked falling behind its competitors. In April 2010, the EURO V quality fuels were introduced in a number of INA filling stations. The premium quality product, which included fuels blended with bio-components, required an appropriate premium filling station network, so a long-term project of revitalizing INA’s retail – named Blue Concept – was initiated later that year. Capital investments in this segment were subsequently more than doubled compared to 2011, and altogether 130 filling stations were thoroughly modernized and received a new visual identity by the end of 2012. The comprehensive upgrade included the modernization of the infrastructure, better technical equipment, higher service levels and a wider choice of fuels and non-fuel items to enhance customer experience and satisfaction levels. As of early 2014, 160 stations had undergone this modernization program. The dynamism and pace of modernisation are far superior to the development of this business area before MOL’s control. As a result of these efforts (investment the retail network, in the refinery system and improving overall operational efficiencies), INA successfully reversed the decline in its market share both in Croatia and elsewhere. This result was achieved in a market environment that was fundamentally changed by the continuing recession in Croatia (where the oil product market has contracted by 28%) and the accession to the EU’s internal market (where protectionist measures such as trade barriers that had protected INA are no longer possible). In the summer of 2013, INA decided to launch a pilot business management project in its retail segment to further increase its competitiveness. This change of operating model responds to the increasing maturity of the Croatian fuel market, and reflects the evolution of other European retail markets, where it is widely used. The project called “Become an Entrepreneur” offers the managing rights in selected stations to the best qualified entrepreneurs to allow for independent filling station operations, while INA retains ownership of the assets such as concessions, properties, buildings, infrastructure, goods and products. Entrepreneurs benefit from fuel and shop turnover and from the introduction of higher quality services and efficiency measures to ensure profitable operations, for both the entrepreneur and the owner, INA. Based on the experiences gained from the pilot phase, INA will decide about the future of other similar programs.